Sue recognises Frazer Hines immediately. Well, I say recognise. Sue: It’s whatshisface from Emmerdale Farm. He definitely becomes a companion. Don’t ask me why, but I know that for a fact. Does that mean Ben gets himself killed? That wouldn’t be very nice. The Doctor is still sporting a stovepipe hat. Sue: Why doesn’t Ben or Polly tell him that it looks like a dunce’s hat? 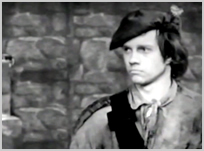 Later, when the Doctor is presented with an opportunity to swap for a Tam o’ Shanter, Sue practically begs him to take it. Because anything would be an improvement on the chimney that’s perched on his head. Sue: This Doctor has a hat fetish. Me: It could be worse, he could be wearing a fez. Sue: Oh yeah, now that you mention it, I can see a bit of Patrick Troughton in Matt Smith. And there’s the bow tie, of course. 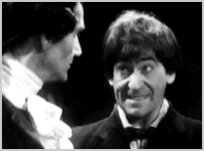 Do you think Matt Smith watched any Patrick Troughton stories before he played the part? And did he sit through any recons? Me: Of course he did. Everyone who auditioned for the role had to watch at least one recon. I believe Chiwetel Ejiofor was a big fan of Mission to the Unknown. Thanks to some nervous Australian censors, we’re treated to some surviving footage, which means we actually get to see Patrick Troughton’s feet move for two – infinitely fascinating – seconds. Sue: What an odd thing to cut. It was okay to show him with a noose around his neck, but they couldn’t show him standing on a bench? Australians can be very strange sometimes. Sue is convinced that Kate Bush is playing Kirsty, even though I’ve told her it’s Hannah Gordon, and when Frazer Hines’ narration mentions windy moors, there’s simply no shifting her. Sue: Didn’t Kate Bush write for Doctor Who? I’m sure you told me that once. Me: Yes. Yes, she did. Sue: I look forward to it. Oh, wait, now that I can see a better image of her, I recognise her now. She isn’t Kate Bush. Me: I know! It’s Hannah Gordon! Sue: Wasn’t she in Crossroads? Sue: I still can’t get a handle on Patrick Troughton. I’m sorry, Neil, but he sounds drunk to me. He’s a mess! Me: He isn’t the Doctor yet. This is another atypical performance. The atypicality is ramped up another notch when the Doctor suddenly launches into a German accent. Sue: He sounds like Peter Sellers in that film where they fight in the war room. Thankfully, Sue didn’t pick up on the reference to Doktor Von Wer, otherwise we would have ended up having a “Doktor comma Von Wer” debate, and nobody wants that. Sue: I enjoyed that. I can handle the recons when the stories are rooted in reality. Now if only the Doctor was. Sue: One thing I’ve noticed about this story so far is the lack of science fiction in it. Me: That’s nothing new. We’ve seen lots of historicals. Sue: Yes, but William Hartnell’s Doctor always felt alien to me. He stood out like a sore thumb. He was the science fiction element in the story. Troughton blends into the background a lot more. He’s just another character in the story. Does that make any sense? At least Polly is trying to be proactive. Sue: She’s got a cheek, moaning about being too girly, given that all she ever does is make coffee and scream. She’s acting like a completely different character all of a sudden. Not that I’m complaining. But the highlight of the episode has to be the delightful moment when the Doctor locks a solicitor in a cupboard. Sue: Troughton has proved to me that he can do comedy, but he’s the total opposite of William Hartnell. Hartnell was serious with flashes of comedy; Troughton is comedic with flashes of seriousness. It’s a massive departure, and I don’t know if I like it or not. At least Sue likes this episode’s wood. Sue: I know some people will laugh at me for saying this, but the carpentry is fantastic. I’m deadly serious. The BBC had some great carpenters. Has anyone made a documentary about the carpentry in Doctor Who? They haven’t? They should. If I could go back in time and live my life all over again, I’d be a carpenter for the BBC. Me: Just think, you could have erected Paradise Towers. It’s Father’s Day today and Nicol gave me a lovely card. It was homemade (always the best kind), and it featured the TARDIS exterior on the outside and a photo of me posing next to the 10th Doctor’s console at the Doctor Who Experience on the inside. Nicol: Sorry about the mistake. Me: What mistake? It’s perfect, Nic. Nicol: It’s Matt Smith’s TARDIS on the outside and David Tennant’s TARDIS on the inside. I know it’s not quite right. Sue: For ****’s sake, Neil. It’s bad enough that you’ve dragged me into this world of yours, you can’t drag Nicol in as well. Me: Blame her boyfriend. He’s making her watch the Matt Smith episodes. I have nothing to do with this. 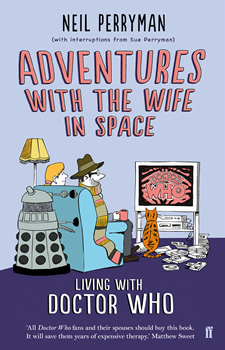 Nicol: Given that it’s Father’s Day, do you want me to watch Doctor Who with you tonight? Nicol: I’ve just remembered that I have to revise for an exam. Me: But your exams are over. Nicol: Then I’ll revise for my re-sits, just in case. Sue immediately becomes fixated on two things – the Doctor’s transvestism and his decision to brandish a gun. Sue: The Doctor doesn’t usually use a gun, does he? Me: Very rarely. This is a bit out of character for him. Sue: I suppose he’s managed to subvert it by dressing as a lady. Do you think Monty Python were inspired by this? He looks like Brian’s mum. Meanwhile, Ben and Jamie are being held captive on a pirate ship, and the episode ends with Ben being thrown overboard. Me: That’s it. Ben’s dead. Sue: Oh no he isn’t. Me: You said it yourself, Sue – if Jamie joins the crew, Ben has to leave. Sue: No way… But that’s horrible! Look, it’s the only pleasure I get from watching this drivel. Give me a break. Sue: At least he died a sailor’s death. It’s what he would have wanted. If there was ever a moment when the experiment threatened to derail itself – or at least have its parameters fundamentally changed – then this is it. I’ve got recon fatigue (this will be our 10th in a row), and I’m beginning to struggle. Just thinking about spending another evening watching yet another reconstruction depresses me. It hangs over me like a cloud all day. In fact, I seriously consider throwing in the towel. I’m not only flirting with failure, I’ve invited her back to my place for coffee. Me: It’s been suggested that we skip ahead to a surviving story, so you can get a proper feel for Patrick Troughton. Sue: I suggested that last week and you dismissed the idea out of hand. How many recons are left until Troughton moves? Me: Two, not including the one we’re about to watch. Sue: That’s not so bad. I can last until then. Me: Or we could just skip the recons entirely. Me: I didn’t plan on showing you all the recons – maybe one or two, just to give you a flavour. The original plan was to read out a synopsis for the missing episodes. We didn’t watch Marco Polo in seven parts and nobody had a problem with that. (Note: everybody had a problem with that – see Volume 1). Even Steven Moffat can’t be arsed to sit through The Power of the Daleks. Sue: Well, if Steven Moffat can’t be bothered, maybe we should skip them, after all. Our daughter has the last word. Nicol: You can’t give up now. It’s like climbing Mount Kilimanjaro, Neil. You can do it the hard way, or you can do it the easy way. You know, with the comfy beds and the ice-cold bottles of coke. You’d still get to the top, but you wouldn’t feel the same sense of achievement. Me: This is nothing like climbing Mount Kilimanjaro, Nic. This is much, much worse. Sue: I vote that we carry on. We’ll only regret it if we stop. Me: Okay, we’ll carry on. But let’s spice things up a bit. Let’s watch the last part as an animated reconstruction! I manage to stomach 64 seconds before I have to switch it off. Me: I’m sorry but I can’t watch 25 minutes of that. It’s Captain Pugwash meets Waiting For Godot. No disrespect to the fan who made it, but I’d rather chew my own leg off than watch the whole thing. I revert to a tried and tested Loose Canon recon for the final episode. Sue: Ben isn’t dead, you git! I knew you were winding me up. Me: I know this is all about you, Sue, but I have to say that this is the worst story I’ve sat through so far. At least The Celestial Toymaker was interesting. This is irritating. Sue: In what way is it irritating? Me: Do I have to spell it out to you? We’ve got the Doctor playing ‘the Doktor’ with a comedy German accent, and he’s embroiled in a scenery-eating contest with a pantomime “Oooh-arrr!” pirate. It’s doing my head in. Sue: It’s definitely odd, but that’s Doctor Who for you. The Highlanders concludes with a massive battle on a ship. Or if you’re watching the recon, with the sound of men huffing and puffing for several minutes. Sue: Jamie didn’t do very much. I’m surprised he didn’t play a more active role. And I bet there’s a love triangle between Jamie, Polly and Ben later on. It’ll end in tears, you mark my words. Me: I never knew The Highlanders was like that. I always thought it was a story about the Scots fighting the Redcoats, with plenty of sword-fighting and people hiding in caves. I didn’t expect a bloody pirate adventure! I wouldn’t mind, but we had one of those a couple of weeks ago. I’ve got pirate fatigue coupled with recon fatigue and I don’t know if I can take much more. Sue: Don’t worry, it’s finished now. I’m sure the next one will be a lot better. Sue: It was all right. Unlike you, I didn’t have a problem with it. I’m sure I would have gotten more out of it if it existed, but I’ve seen worse. And I like the historical ones. Plus it’s a recon, so you have to give it the benefit of the doubt.